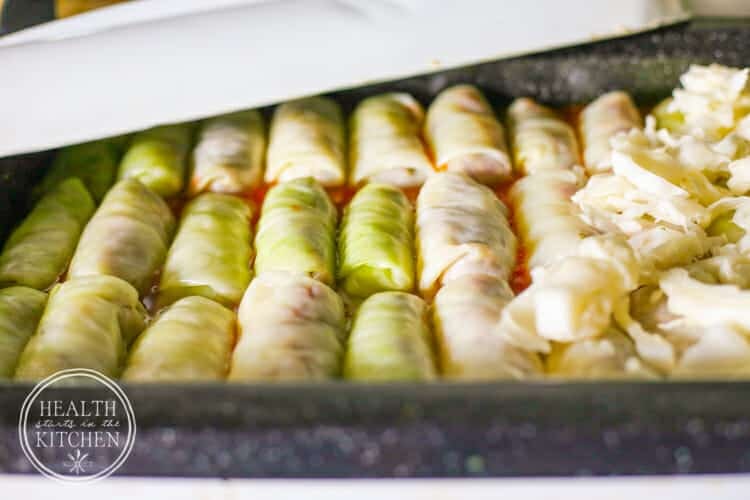 Stuffed Cabbage Rolls with Tomato Sauce, also known as halupki, is a family favorite for both my husband and I. Both of our grandmothers made them regularly, and I’ve come up with my own version that is a perfect combination of our two families’ recipes, only made without grain. The key to making this family favorite, comfort food Paleo, Grain-Free & Low-Carb Friendly is switching from regular rice to cauliflower rice. And while it may not see like it, you won’t even be able to tell a difference! 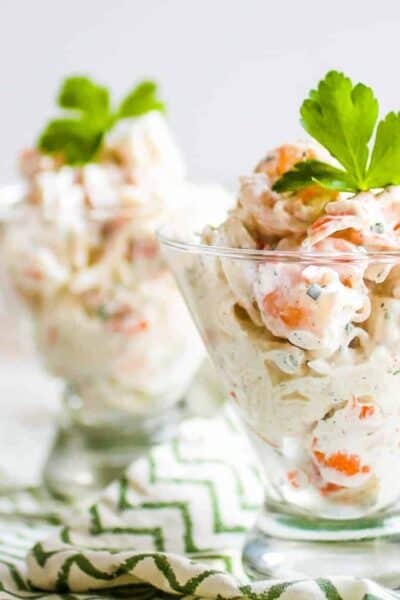 Serve with a heaping spoon full of Mashed Potatoes or Mashed Cauliflower for a complete meal. 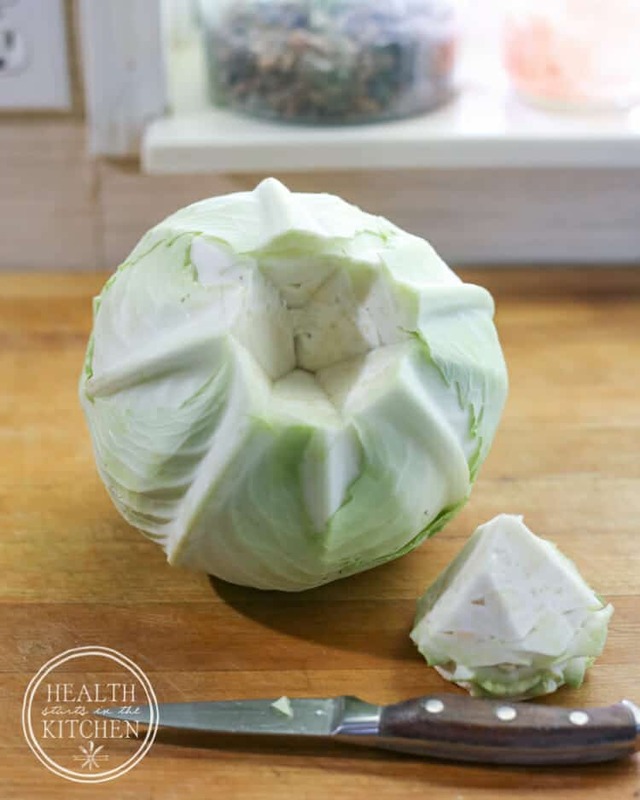 Carefully remove core from head of cabbage and discard discolored outer leaves. Fill a large-size pot about halfway with water and bring to a boil. 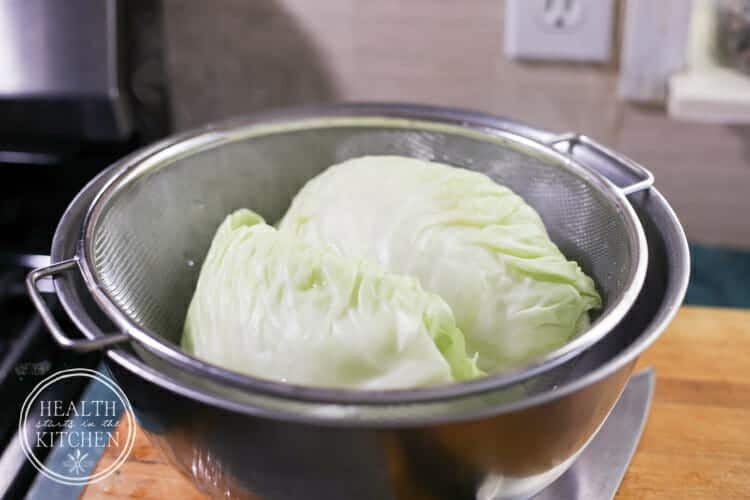 Place the whole head of cabbage into the water (it should be submerged). Boil until it is al dente and the outer leaves can be peeled off without breaking, 10 to 15 minutes. Set aside to cool. 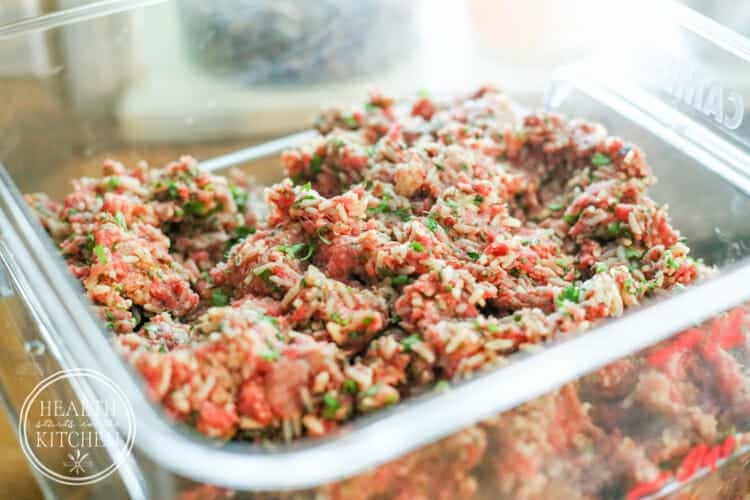 In a large-size bowl, combine the ground beef, cauliflower rice, parsley, onion powder, salt, garlic powder, and pepper. Use your hands to mix well. 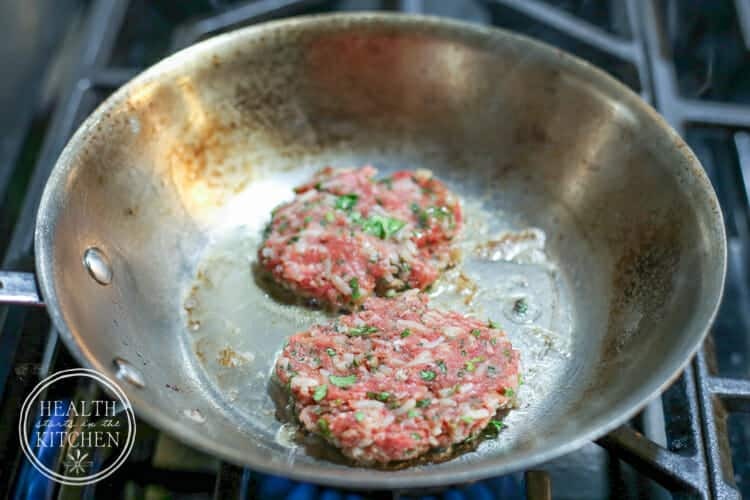 For this recipe or any similar (meatballs, meatloaf, etc) to check your mixture for correct seasoning, cook a small patty to sample. 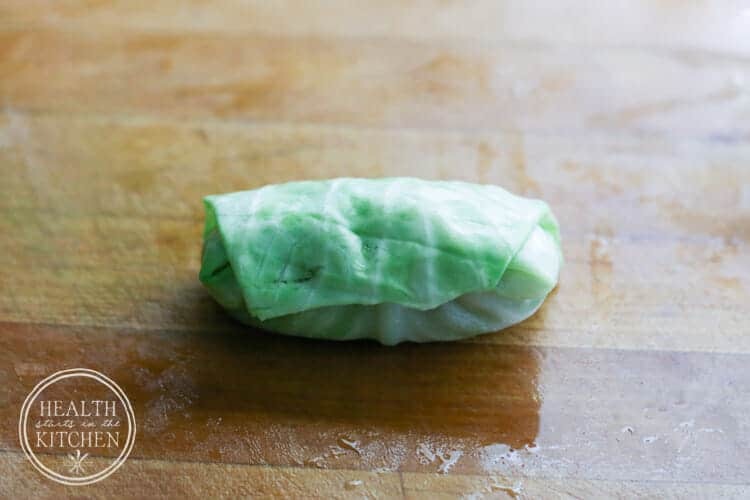 Gently peel the outer 8 leaves off the boiled head of cabbage and reserve for the cabbage rolls. 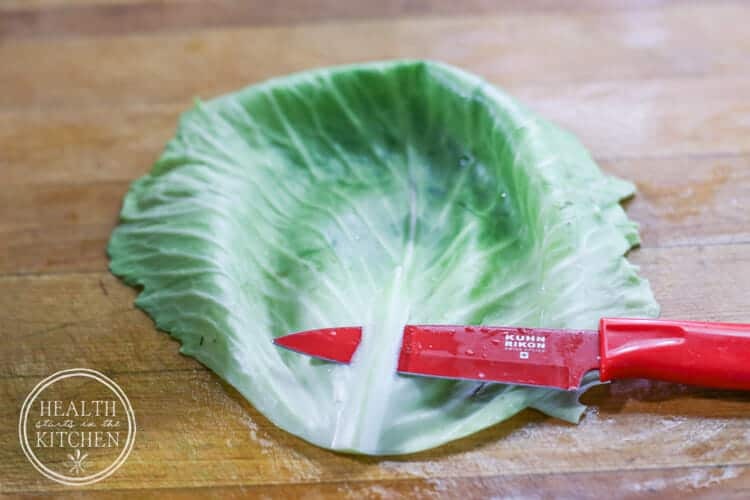 With a sharp knife, shave off any thick veins from the outside of the reserved cabbage leaves. Quarter the remaining head of cabbage, cut out the core from each quarter, and place in a Dutch oven or 2-quart (2 L) casserole dish. 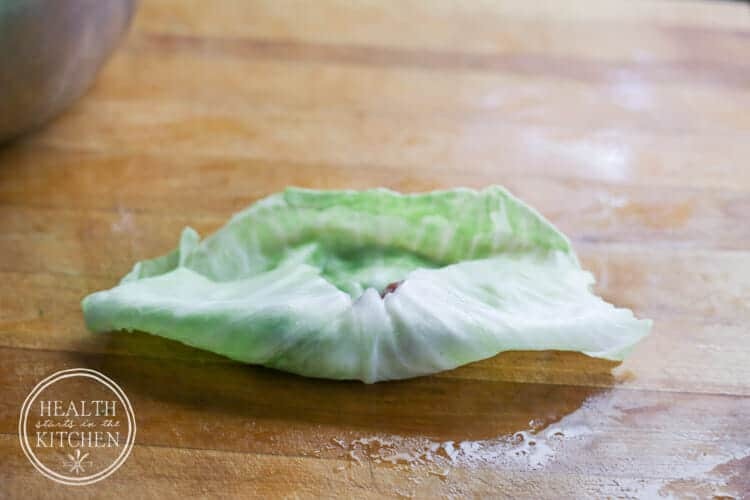 Lay a cabbage leaf out in front of you so that where is was connected at the core is toward you and it is curling up. Place one-eighth of the meat mixture about 2 inches (5 cm) from the edge closest to you and shape the meat into a 3-inch (7.5 cm)-wide log. Fold the 2 inches (5 cm) closest to you over the top of the meat and roll it so that the edge is underneath the meat. 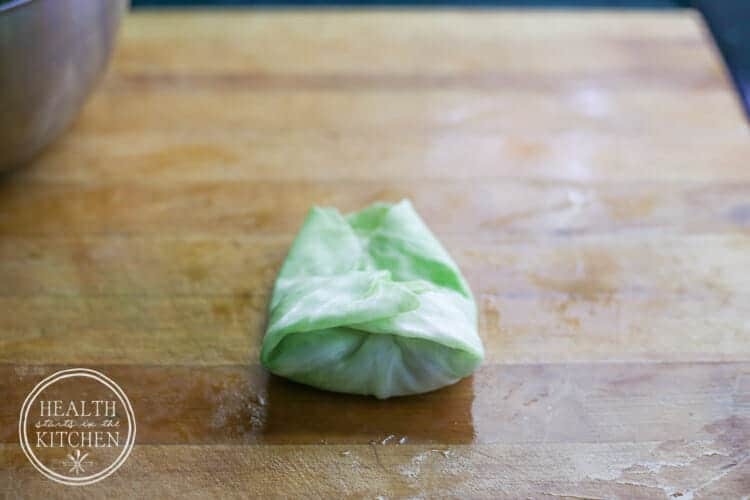 Next, fold the right side of the leaf over the meat (you can trim the sides if there is more than 2 to 3 inches [5 to 7.5 cm] of cabbage). Roll the meat forward, toward the farthest edge. 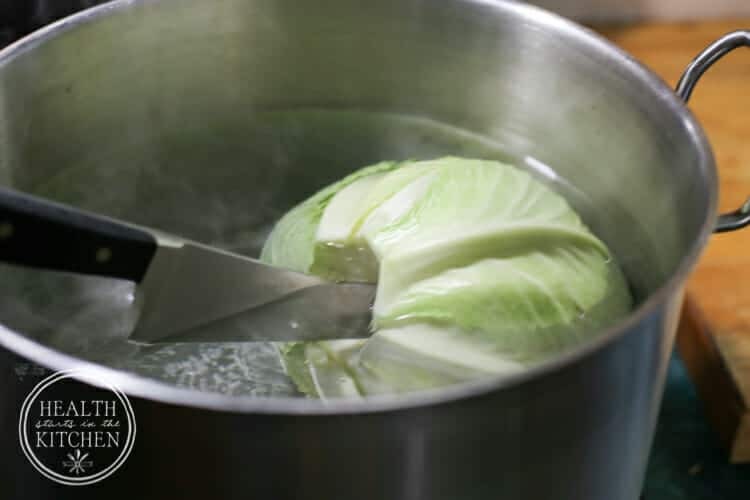 Place the cabbage rolls, seam-side down, in the Dutch oven, casserole dish, crock pot/slow cooker or pressure cooker, along with the cabbage quarters. Pour the tomatoes and juice over the top, and sprinkle with additional salt and pepper. Bake: Cover and bake at 350 for 2 hours, or until the rolls are so tender you don’t need a knife to cut them. Pressure Cooker: cook under high or standard pressure for 20 minutes. Allow to naturally depressurize. My mom makes stuffed cabbage all the time, it’s one of my fave! 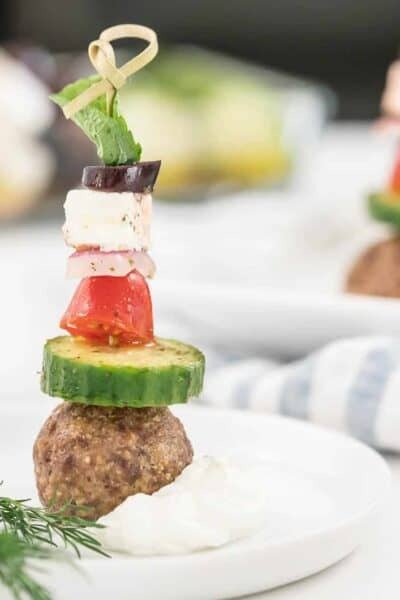 I’m going to show her this low-carb version that I know she’ll appreciate ! 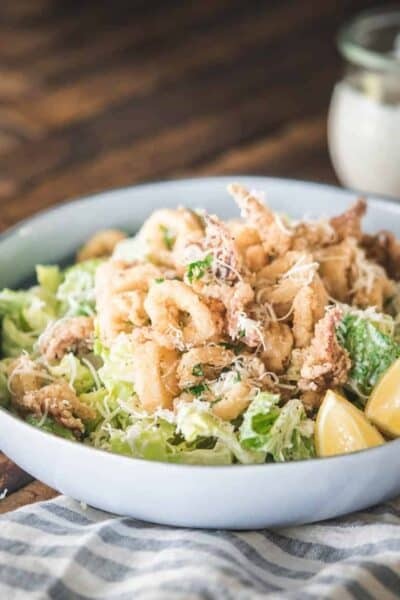 If you want a bit more flavor, you can actually chop up an onion, instead of using onion powder and fry them up until translucent, with a couple of strips of bacon. Then add fresh garlic. 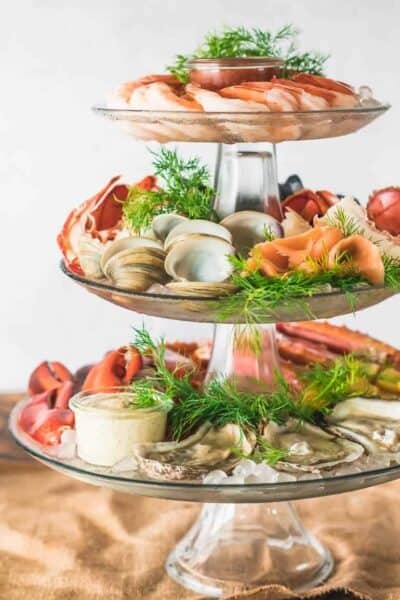 The bacon fat is also paleo and keto, and if you use smoked bacon, it really adds a nice taste. 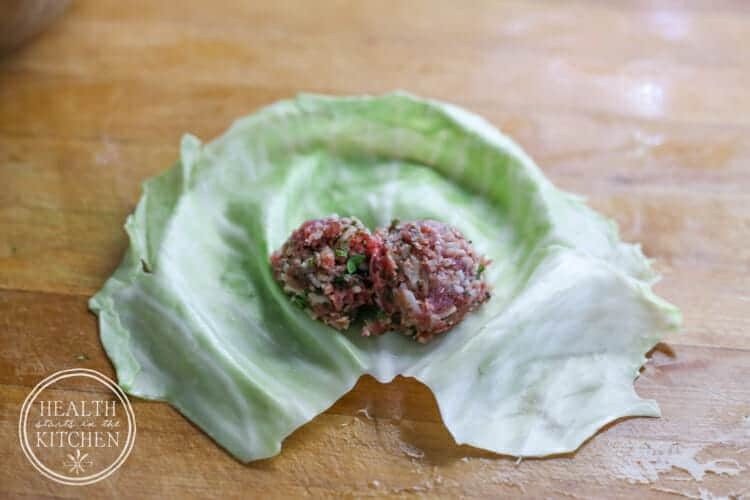 Another way to make them is to layer them in a pot, I add tomato juice and some water (low salt, and low sugar if I can find it) and a bit of stock (chicken or vegetable) and place a couple of cabbage leaves on the top, cover and simmer for about 90 minutes. Your recipe is very authentic though. I am going to try it this weekend. 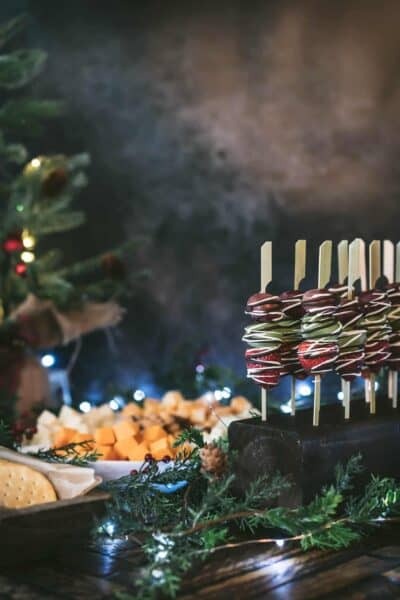 Can these be frozen and then eaten at a later time? This is my daughter’s favorite food ever! Thanks! 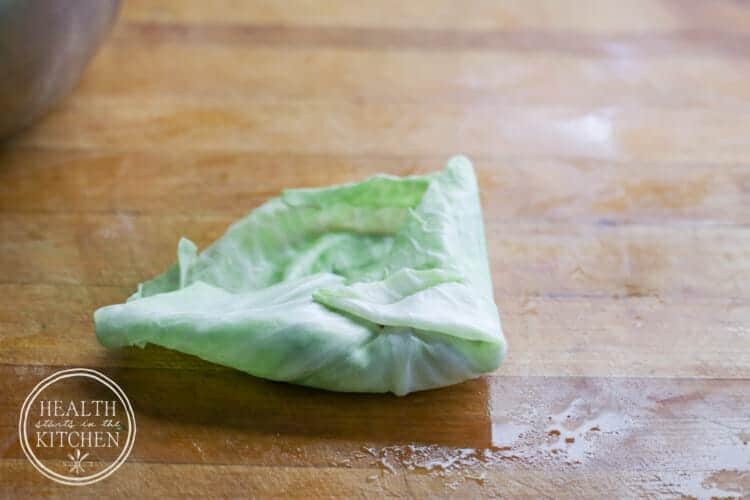 I heard so much about stuff cabbage, Im on a no carb or low carb, and the stuff cabbage sounds good and low fat and low carbs, nevered had it before, sounds pretty easy to prepare. Make sure you aren’t avoiding fat while eating low carb, to reap the benefits of low carb eating you need FATS!